Search Results for "planting seeds"
1930s: Hands let seeds rinse through palms. Man plants seeds in the ground. Hands plant seeds one by one in the ground. 1950s: UNITED STATES: hand drops seeds in box. Girl plants seeds in seed box. Seeds grow indoors. Farmer in tractor planting seed in field agriculture DCI 4K 011. Rural community where farming is the main source of employment and income. Farmer in tractor planting or drilling alfalfa and grain seeds in prepared field. Agriculture farm tractor planting seed in field away DCI 4K 008. Rural community where farming is the main source of employment and income. Farmer in tractor planting or drilling alfalfa and grain seeds in prepared field. 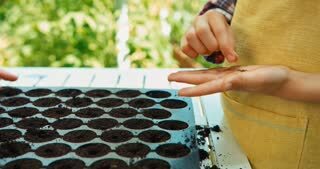 The young couple plants seeds and small plants in their garden. UNITED STATES 1940s: Farmers plant seeds, harvest, and prepare plants for selling. 1960s: Boy and girl plant seeds in small garden. New plant growth and weeds in small garden. 1960s: Man pours water for goats. 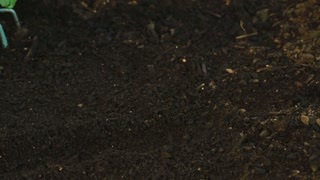 Close up, plow in ground, woman plants seeds. Pan across field, woman gathers plants. 1950s: Man uses metal pole to dig holes in dirt for planting seeds. Boy follows placing seeds in holes. Senior Woman Planting Seeds in an Egg Pack. Close-Up. Full HD. Tractor at work, prepares the field for planting seeds. Aerial view. Planting seeds into eggshell containers. Planting seeds With Tractor in springtime. Agricultural Planter on the Field. A woman gardener is planting seeds of radish in the backyard.